After learning that Clem doesn’t plan to invite her father to the wedding, Nick’s parents encourage her to ask him over to their home for dinner to help repair their relationship. Also, Nick tries to teach Shannon to be more responsible at home. Starring Nina Dobrev (Clem), Tone Bell (Nick), Odessa Adlon (Shannon), Sheryl Lee Ralph (Rose), and Brian Stokes Mitchell (Walt). When Nick's mother catches on to the fractured relationship between Clem and her father, she proposes they invite him to a family dinner for her to work on mending fences in time for the wedding. Clem is less than enthused by this prospect, and who could blame her? Freddy has been absentee her entire life and even when he does wind up coming to this family gathering he cons Walt out of money for a faux-charity to feed his gambling addiction and brings bloodstained crime scene wine. Picture of class he is not. At the end of the episode, Freddy and Clem bond over horse racing, proving that perhaps hope between them is not completely lost. Plus, we learn Freddy can belt out a mean version of Sir Mix-A-Lot's "Baby Got Back". Since Shannon has been living with Clem and Nick she has brought all of her bad habits from living with Freddy alongside her like excess luggage. Crusty bowls and dirty plates litter the kitchen, hide in cabinets, and sit out on the couch overnight because she doesn't know how to work a dishwasher apparently. No really, she doesn't. Nick finds a shoe in there at one point. They try to coax her into doing at least a little more around the house compared to the absolute nothing she's doing now. But given the fact Nick finds yet another gross dish tucked away amongst the clean ones later, it's a given this will be a long, slow, arduous process. Nick: That woman is obsessed with sending out "save the dates" unfortunately she calls them STDs. Shannon: Why would you want to take the pot roast home, there's no pot in it. Nick: When it comes to her tupperware that woman is like Liam Neeson and those little glass containers are her abducted daughters. - It's funny at first but are we really supposed to believe Rose doesn't get the blatant STD joke? - Ugh, Freddy is not a character I can see myself ever liking. Luckily, I love every other character but finding him increasingly annoying. Also what could he have possibly bought from Best Buy to put himself in serious debt there? His apartment didn't appear to be bursting with electronics. - The hardest selling point of this show is that I should root for Clem, Shannon, and Freddy to become a family again when Freddy is by all accounts, a terrible person and neither of his daughters owe him a single thing. 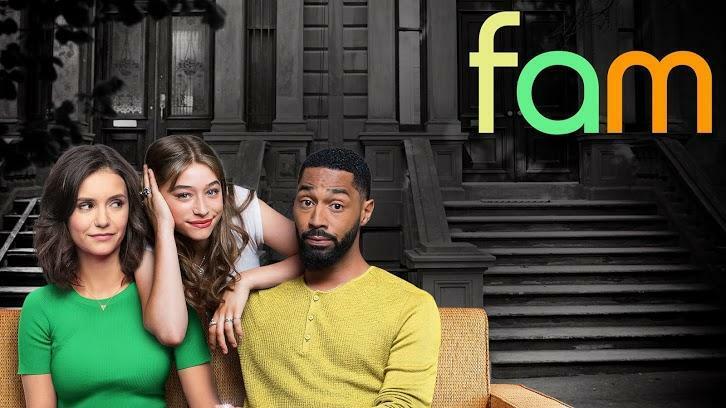 When Clem and Nick discover that Shannon stole Walt's watch, they enlist Freddy to get it back from a merciless pawn shop owner, on Fam, Thursday, January 24th.